Midwife and maternity support worker members of the Royal College of Midwives were out in force at the TUC ‘Britain Needs A Pay Rise’ demonstration in London on Saturday [18 Oct]. 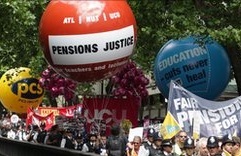 The RCM’s participation in the march comes in the same week that RCM members took strike action over NHS pay. This was the first strike action in the RCM’s 133 year history. The march followed four days of further action (14-17 October) where RCM members took their breaks and claimed for any overtime worked. Cathy Warwick, chief executive of the Royal College of Midwives, said: ”I was overwhelmed by the huge response from our members to industrial action. It shows the depth of feeling on this and the levels of anger and discontent among our members.